With spring around the corner, we’d like to provide an update on upcoming activities for the Kings Beach Commercial Core Improvement Project. With our board of supervisors last month approving the final phase of work for the project, here are some highlights for what we have in store this summer. Replacing damaged traffic control posts. We hope to award the construction contract for this work in late May, with work beginning in June. We should be able to do the majority of the work from the road shoulders without lane closures. 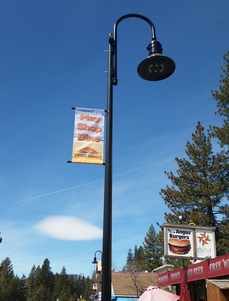 With the recent approval of the Tahoe Basin Area Plan, we’re planning more community outreach this spring to discuss future projects mentioned in the plan that the county, developers and other agencies in the area are considering. It will be a great opportunity for you to share your thoughts and provide feedback on future Kings Beach improvements. We will continue to share updates on both parking and landscaping improvements as construction nears, and will be in touch with the date, time and location of upcoming outreach opportunities as soon as we have those details. Please feel free to email our project manager, Dan LaPlante, at dlaplant@placer.ca.gov or call the Placer County Department of Public Works and Facilities office at 530-581-6231 with any questions or comments.